Salmon has gained huge popularity over the last few years and why not? It’s flavorful, good for you and there are so many delicious ways to prepare this fish. 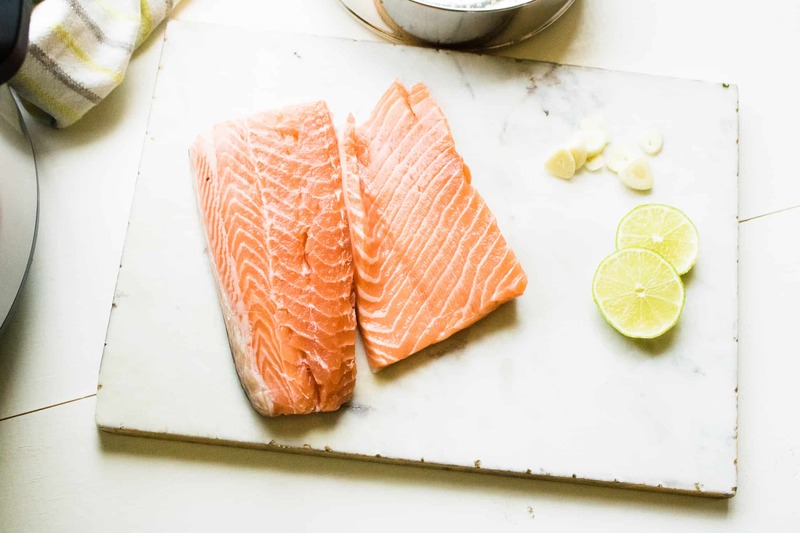 If you are looking for a simple, easy, quick salmon recipe that tastes amazingly delicious, look no further than this Instant Pot Lemon Garlic Salmon. Serve it as a quick family dinner option, or as a delicious, elegant entrée for entertaining guests. 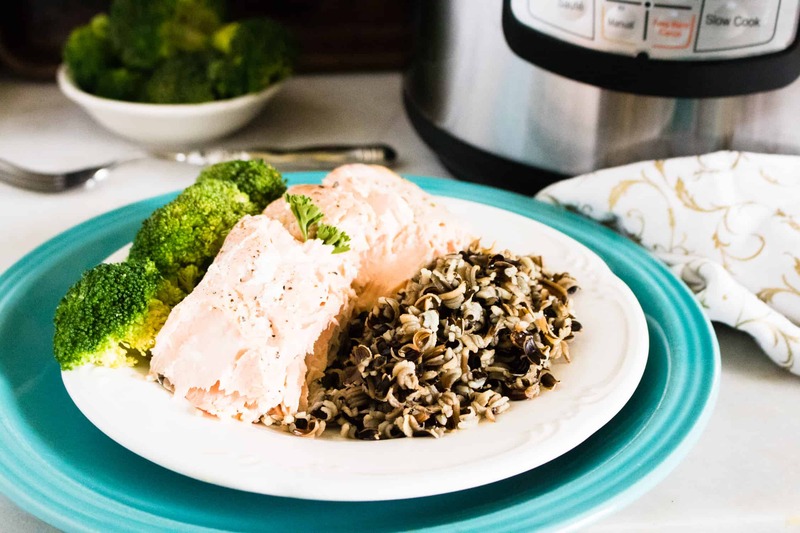 What’s To Love About Instant Pot Lemon Garlic Salmon? There is a long list of things to love about Instant Pot Lemon Garlic Salmon. Keep reading to find out what a few of them are! It is super easy and quick. Because there are only a few ingredients for this delicious recipe, it is a breeze to pull together. Slice a few lemons, cut up a few garlic cloves, put fish, lemons, and garlic in the time-saving Instant Pot and you have restaurant worthy salmon entree in less than 20 minutes. It’s healthy! Salmon is nutrient-dense and packed with protein, so not only does it taste fantastic, but you can feel great about having it for dinner. It is deliciously elegant. This recipe is so simple and only has a handful of ingredients, but the finished product looks and tastes like something you would order at a fancy restaurant. 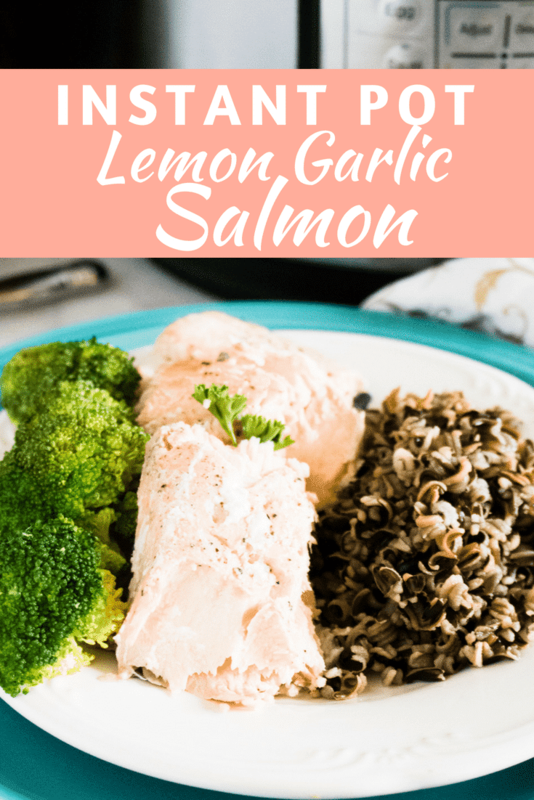 What Should You Serve with Instant Pot Lemon Garlic Salmon? Again there are so many options of accompaniments to this amazing recipe. Look below! How about starting off with an easy and delicious salad such as Keto Salad Wedge with Homemade Blue Cheese Dressing. We show broccoli as a side veggie in this post, but another great, easy, colorful and delicious option for a vegetable to serve with your Instant Pot Lemon Garlic Salmon is this Super Easy Tricolor Roasted Carrots recipe. And to round out the plate with more color and flavor, try this Colorful Rosemary Roasted Potato recipe. Yum! Step #2: Add salmon to a baking dish and top with lemon slices, garlic cloves and salt and pepper. Place the baking dish on top of the trivet in the Instant Pot. Cover with a lid or foil. Step #3: Close the lid on the pressure cooker and turn the valve to sealing position. Step #4: Set to a manual high time for 10 minutes. When the cooking time has finished, do a natural release for 5 minutes before releasing the rest of the pressure. Step #5: Salmon should be flaky. 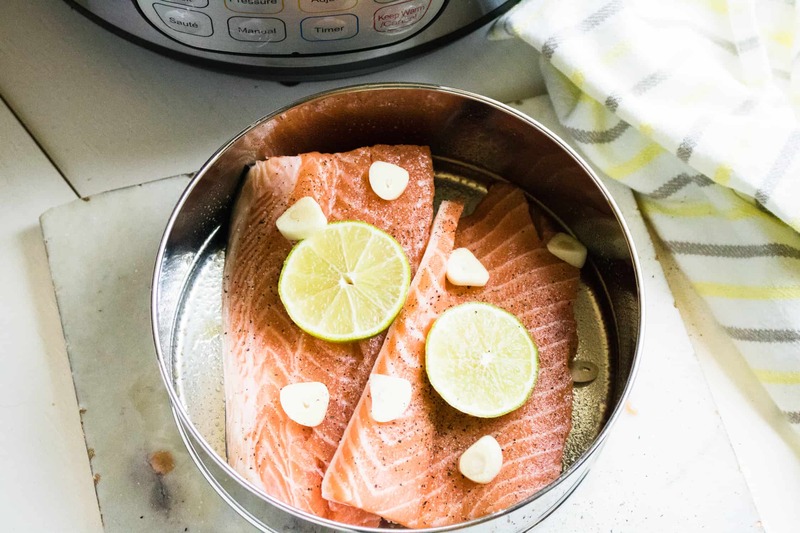 If salmon has not cooked completely, place the pan back into the Instant Pot with the lid/foil on it and cook for an additional 3 minutes, then perform a quick release. 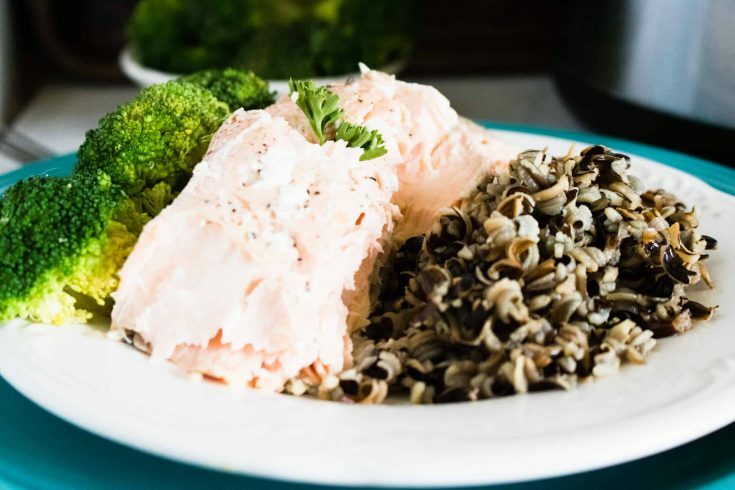 This simple, easy, quick salmon recipe looks and tastes amazingly delicious! Add salmon to a baking dish and top with lemon slices, garlic cloves and salt and pepper. Place the baking dish on top of the trivet in the Instant Pot. Cover with a lid or foil. Salmon should be flaky. 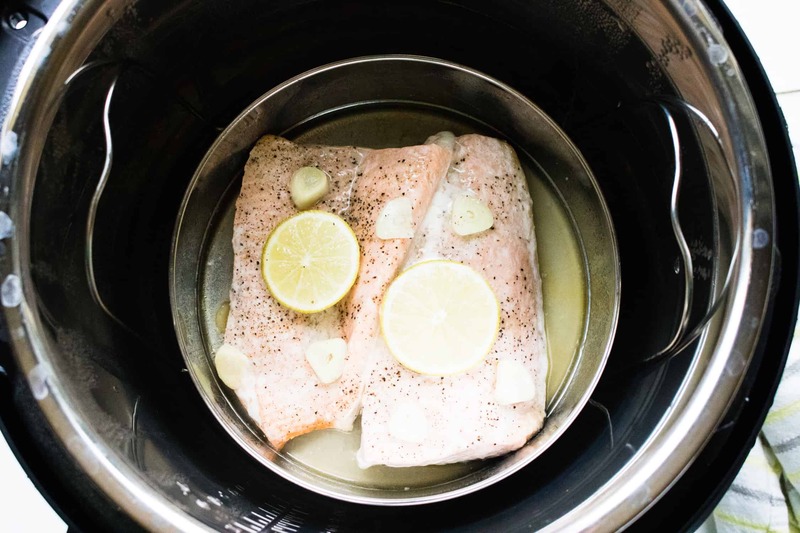 If salmon has not cooked completely, place the pan back into the Instant Pot with the lid/foil on it and cook for an additional 3 minutes, then perform a quick release.